Turning Suffering and Happiness into Enlightenment (Tib. སྐྱིད་སྡུག་ལམ་ཁྱེར་, kyiduk lamkhyer, Wyl. 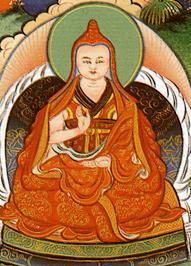 skyid sdug lam khyer) is Dodrupchen Jikmé Tenpé Nyima’s famous instruction on lojong—’training’ or ‘transforming’ the mind. Whatever comes to us in life, be it happiness or suffering, this extraordinary teaching shows us how to transform and draw the very best out of it, and use it for our ultimate benefit and the benefit of others. Kyi (སྐྱིད་) means ‘happiness’, duk (སྡུག་) means ‘suffering’, lam (ལམ་) means ‘path’, and khyer (ཁྱེར་) means ‘to carry’ or ‘to take’. This page was last edited on 17 January 2018, at 22:10.